We’ve had some great feedback from our members so far – check it out below! If you like what we do and want to share your great experience we would love your feedback. Post it in the comments section below or drop us a line at [email protected] . Thank you, we appreciate it! My didgplaying is going better and better, I think. Nevertheless, I still have to practise a lot, and now with the tapping sticks, something more to practise. It's cool I love it! Thanks for the good teaching! Thanks a lot for your email and your interest in my lerning courve.It was the best idea to register on didgeridoodojo, your lessons are very clear and step by step i realise how to play digeridoo. now i try to play didgeridoo since about 3 month every day for more or less 1-2 hours and it becomes better and better. for the moment i am really very happy with your teaching videos and i use it almost every day. but at the moment every thing is perfect. Thanks a lot to you and your crew, it is really the best i could find. There's so many awesome things on your site you feel like going through all the lessons at the same time - especially being a beginner 🙂 !! So the e-mail courses is a great idea to get the over-motivated ones in a structured progression!!!! Cheers mates! And once again, thanks for all the material. Actually to tell you the truth 😉 I've signed up for the yearly membership and have also starting following some of your lessons there but I find the 30 day crash course gives a good rhythm to the learning curve and in the event also a good revision. So looking forward to the next ones. I am most of the way through the Beginner section of the lessons, and I am having the best time. The lessons are great and you make them fun. You are a very clear and precise teacher. I am having trouble with vocals, so I plan on videoing myself doing them and sending you links to the videos if they still don't sound right. I'll let you know. First of all I would like to give you a great "THANK YOU"!!!! I really estimate your training style. The lessons are demanding but with this smile on your face you get the best out of me. At least I hope so 😉 Right at the moment I got to the advanced lessons. I take pains with the wobbling sound. As you desribe: practise, practise, practice. I signed up to your class in august, but it is only 2 weeks tat I came back home and started your classes. Great...great..great! I just love it, I am at the circular breathing this week. I'll let you know if I have difficulties. I went for quality and spent quite an amount, so I will have to wait abit to renew my account. Next paycheck and I'll be back! Your teaching is great, easy to understand and very straight forward. You are a fun caracter and seem to have a genuine love for the instrument (and you are a good player , too) which makes the quality of the lessons really good. I have only seen the tip of the iceberg, and can't wait to explore the world of the didj through the dojo (in the meantime, I am practising my circular breathing:). First I want to let you know how fantastic I find your site and I am really very appreciative of all the work that's done into it! Thumbs up: Exactly what I was looking for: comprehensive and step by step, breaking the myths and making it accessible to everyone !! And also congratulations for your teaching skills). Now, to answer THE question: I was going to say something technical and specific about the didgeridoo, but your hint put me on another track, so I would say "PRATICE". Looking forward to working through this course!! I see you wanted feedback on your site & its all good for me. I loved watching your videos, they were extremely helpful & i would not change a thing on your site. I just got my didge 2 weeks ago & have been playing it 3 or 4 days per week & because of your circular breathing videos i can do it "almost" perfectly with out the gaps now. Sanshi you are an awesome guy & didge teacher, i enjoyed your videos & i will recommend you to everyone that wants to learn to play the didgeridoo . Thanks a lot for the test drive which I will change the week after next week into a 1 year subscription (next week I´m on a workshop). I really LOVE my didge you sent me a month ago and with the enclosed CD I´m doing suprising progress. The way you´re doing your thing is really stunning and in the lessons I can feel the joy you must have doing that „work“. I did receive your emails. Thank you for the follow up and great lessons you offer. It makes Australia and the didge seem only miles away. I'm very happy to say that with your step by step method of circular breathing I've learned the basic rhythm. Although I was naive to think that once I accomplished that I would be good to go. However, I now realize it's a good beginning to getting better at playing this incredible instrument. To integrate the circular breath into the tongue and vocals will take some doing. You asked for feedback and I would like to take this opportunity to offer some. I believe your method for learning the circular breath is second to none in addition to being an excellent model for some of the other techniques. Most specifically the rhythm lessons'. I intend to stay in touch and of course keep on practicing. And be sure to put me on your mailing list. P.S. I also play the Native American flute. I'll send you some photos while playing down in the canyons of Utah. I am quite satisfied with my circular breathing ,now I already understand it but I have to try it. You explained it very slowly and simple. I think you had very good idea with these sites. Not only for your job, but also for us didger-beginners. So thank you Sanshi, keep on like this. Honestly your free trial was amazing and taught me how to circular breathe in less than an hour. I have already referred it to a number of people who I know have been struggling with circular breathing. Thanks for what you've done though it was a great help and you seem really passionate about the didgeridoo. Am loving the site. I'm a beginner who's been able to make a pretty plain drone sound for quite some time, but have never advanced to new sounds, nor circular breathing. Since watching the lessons for circular breathing, I have almost closed both "gaps" on my breathing, which has me super motivated to practice until I get there - very exciting! Your explanations of the breathing and (most importantly) reassurance that the "squeeze" doesn't need to sound great in the first instance, is what has really made the difference. I previously gave up on trying because I couldn't get the squeeze to sound good. Now, I'm not quite sure how, but the squeeze is slowly turning into a drone for me, simply through persistence. Thanks for the great help so far. Much appreciated!! I have been playing didgeridoo for a few years now, I consider myself to be an intermediate player. I believe the structure of your lessons will be just what I need to help me concentrate on one thing at a time which will definitely improve my playing . I have played through your free trial lessons. Starting at the beginner lessons helps to reinforce the basics of studying the instrument and puts the student on a clear structured path. That is something that is much more beneficial to my learning process and playing progress than surfing the web looking for playing tips. Thank you for didgeridoo dojo. Thank you very much for these lessons: I've learned in a week how to circular breathe starting at level zero!! I know I have still a lot of work to do, but I'm motivated! In fact, didgeridoo is the first instrument that I'm learning whit interest, and thanks to your lessons, I think I've reached a good point to continue and now I have the basis that I needed. I'm only 23 and I am a poor student at the moment, but one day I will be able to travel to Australia to say thank you face-to-face! and you and your team did an awesome job there! It took me since i started to watch the tutorial for the circulate breathing technique more or less two days,to figure out how to do it...not perfect but its there! Going to check out the other tutorials aswell,am sure they as easy to understand as the circular breathing vids! Keep up the great job you guys doin,you helping alot of beginners not to give up that fast,as they propbably would without Didgeridoo Dojo! Hello Sanshi, i´m from far away in a country called Portugal. Since I was little, i love the didge. So, last month i bought one made of bamboo. And since then I´ve tried to play it. Still, You have an awesome website, crew and talent ( teaching isn´t easy). Hey Sashi, well thank you! Your lessons are really amazing, I'm practicing real hard and I'm enjoying your vids, thank you so much. Sanshi, you have got to be the most personable, fun instructor of any musician I have met. I enjoyed every video I was able to watch. Great news! I did it! Circular breathing it's mine! All thanks to you Sanshi. Love your teachings. With your help I finally got it. I can do the circular breathing so now it's the time for better things and lessons. may call it so) - didgeridoo dojo, and the story behind it. And as soon as I spare enough for the annual fee, I intend to join the ride and enjoy lessons from you. thank you so much for your great website. You are a genius and helped me so much in understanding Circular Breathing and actually almost do it now. For sure I am interested to sign up for an annual membership. At this very moment, I'm going to travel next week and I will not bring my didg. to practice. Upon my return in Sept. ...sometime... I'll probably sign up. I just love the way you teach ...very simply and in detail. With you, it seem so easy. Thank you. I LOVE the Didgeridoo Dojo website and have been using it everyday, for 3 days now. I am SO CLOSE to circular breathing, I can't wait to perfect it! Thanks for all you do, and for your enthusiasm for teaching people how to play the didgeridoo! The videos are great and inspiring! I'm ready to re-start playing the didge (I'm not a real beginner, but I concentrated on playing drums and so I "forgot" the didgeridoo ☺ for a while). This site will give me new inspiration, new ideas, new motivation!! Thanks for a great job so well done. I bought Jonny cope's DVD, "how to play the didgeridoo", and your website and videos are way better. I am learning more successfully with just the free portion of your site than I did with this 20 dollar DVD. Mission accomplished sir. I’ve been following your videos and they are superb!!! It’s like spoon feeding a baby. It’s that easy to learn. Thank you for all the classes of Didgeridoo dojo. It helped me realise how far I had progressed since learning and I found I was actually an Intermediate player. I have since been working on your advanced lessons, working with my speed and bounce breathing. my kukabura is coming along nicely, and i am getting a hang of the bounce breathing. Soon I will be ready to put some Youtube videos up of my playing. I will also attribute all my skill to you and your team. I just would like to say that this site and Sanshi are amazing. yesterday i started to practice to circular breathing technique with you videos and now i managed to do it a few times without the horrible sound!!!! thank you very much Sanshi you are a master. absolutly love the website dude!!!!!!!! i bought a didg about 8 years ago when i was in oz, got it home and played about with it, learning various different tones, tounge rolls, toots and vocals, etc. but never really took it seriously and it became more of a souvenir. but i have recently returned from a trip through africa which in turn has left me short of cash, so with nothing to practice i turned my attention on the didj, i had never really given circular breathing a shot so was determined to learn, this is how i stumbled across your website and the FANTASTIC cirular breathing videos you have on there, it has taken me three days to learn how to do it, im amazed!!!!!!!! its not perfect but thats what practice is for, now i can link all i could do with the didg before together, its all fallen into place, ive compltely found a new passion in life thanks to you guys at the didgeridoo dojo!!!! you should be proud of your work!!!! BIG UP THE DIDGERIDOO DOJO AND ALL YOU GUYS THAT WORK THERE!!!! i cant thankyou enough . i haven't had a real good look round the site becasue i have been busy praticing from your videos, but from what i have seen it looks fantastic and ive just checked out your facebook page aswell and gave it the thumbs up. p.s that video of the japanese guy, i think he is called smiley, beat boxing with the didg is unreal!!!!! So far I'm loving the Didge and the Dojo! The dojo is simple, fun and very practical. Plus your teaching makes me wanna go through all the lessons at once! Thanks to you and the whole team. You have a great site with VERY informative and easy to follow videos. Thank you for creating such a wonderful site to learn from. I look forward to future lessons. Your lessons were so good because i like your style, so i was learning stuff that i like to hear and want to play. I teach didgeridoo myself here in the UK and the way you explained things was very clear and will help me in what i do too. After the 7 days Test-trial I can just say that your didge-tutorials are the best that i could find on the Internet. The hardest part for me was the circular-breathing. I tried this months ago and dont get any positive results but with your tutorials i've learned it within 2 or 3 days, that was awsome. So keep it up. I just want to say thanks! I struggled with learning circular breathing for months before I went to your site, and with the help of your videos, I had it within an hour. Thank you so much! I have no suggestions on your site, it seems perfect to me and great, i got circular breathing basically down in a day but i could on last about 3 minutes but im still working on it and going through videos, its really great im learning soo fast. thank you!! The website is an awesome resource and it's great to see information on didgeridoo playing popping up more and more and this is by far the best presented and put together resource that I have seen. The videos are clear and fun to play along with. When I started playing there was nothing like this, and it took me so long to learn, especially techniques like circular breathing with rhythms. You guys are going to open the door to a lot of people playing and continuing to play. I think that your video lessons are amazing. In particular the lessons where you teach how to do the circular breathing! You're circular breathing teaching method is outstanding. After years of half-hearted attempts I think I'm getting there! So far i find you dojo well set up : easy to select and folow lessons, nice and comprehensive. I really enjoy your enthusiam during your lessons :). Btw i want to thank the team for puting all this together : i received my didg a few weeks ago, and i'm really lovin it! You guys have the fastest shipping and handeling i have ever seen (it took 3 days to receive my order in Canada). And the didg is awsem i really love the sound and feel. I love the site....it has taught me so much so fast...and the enthusiasm that you have for the topic is contagious! Keep it up. I really enjoyed it, its the best way to learn Didge on the Internet i know. You are not just a good sensej, you`re also a very funny guy. The dojo is excellent ! The lessons are easy to follow, and I have learnt enough new techniques to be inspired to improve. It is also nice that the camera hasn't stollen your personality or natural charm ! Some other videos or online tuition you see on other websites have a wooden, bland and monotone, camera shy charactor that can't even motivate himself, let alone anyone else. So keep it up! Dear Sanshi, thanks for your message. As I'm pretty busy these times, I've decided myself for a 30-day pass at didgeridoo dojo. I'm actually very happy with this variant, since I cannot go every day on your site. As for some feedback : I'm a teacher myself (well, mathematics, but teacher nontheless !) and I must say that your lessons are very, very well explained. As a novice in didgeridoo playing I find these lessons very good planned, with a graduation from beginner to advanced. Sanshi, your explanations are very clear, and visually it is also quite easy to follow what you're explaining with words or during the play, which is impressive, since playing involves lots of movements ! I first had bought a CD for beginners, but after I saw your lessons, this CD seemed very "empty" in explanations. So, what can I say more : keep up the good work ! I'll sure ask for some new techniques if something comes to my mind. Send my best regards from Switzerland to all the team ! Hey Sanshi! Thanks so much -- your sight is absolutely amazing!!! I'm learning amazingly fast with your insight -- I got my didge two days ago, and I'm surprisingly confident in my sharp, long drone, plus my animal tones are starting to become refined. So all is good here! Thanks again! I have told ALL my friends about your AWESOME circular breathing how to. Let me tell you, since I followed the vidz I can circular breath ...well a little LOL have to put in the time. Well Thank you again and keep up the GREAT work ....you have something special that the whole world is better for. Here in french Canada, everything about didgeridoo is not easy to found...including lessons! So i really enjoy the didgeridoodojo I found more than what i was looking for. It is very complete, very well explained and very....funny. By the way, last december i buy from you, the 5 learning cd collection and I`m really happy to tell you that the item arrived fast ans in perfect condition. I learned circular breathing in no time + some basic rythms..
All there is to say realy is keep up the good work and thanks alot!! Hey Sanshi, thank you a lot for giving an opportunity to get lessons from you and your team. I found you by youtube, by the way i was trying to do circular breathing by other videos, but i couldnt, and then i found didj dojo and saw your 5 steps for circular breathing and i could do it, i was so happy 🙂 thank you. i love how you play that instrument, you are so respectful like they are your children. I am fully satisfied by the dojo site, there is nothing to add, maby when i will become an advanced player i will have some questions. Anyway i wish you good day. Great workshop...i´m from Finland and make music to live...i play many instruments and didge ist something new what i need in my new project...thank you very much, i got lot of tips. 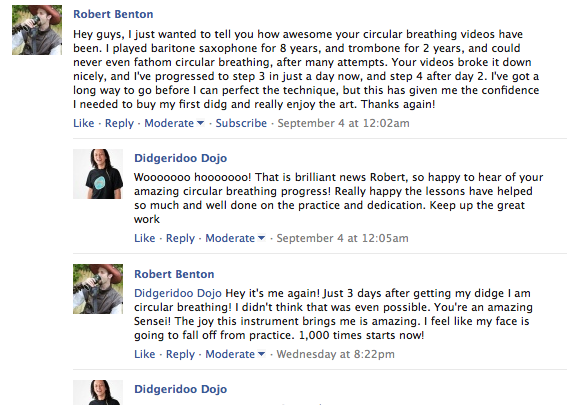 It is a great gift to me that I can have even a few days of the free content at didgeridoo dojo. Thank you for that offer. I have learnt a great deal in the past few days and have been practicing diligently. I have been interested in the didgeridoo for many years. If you are a believer in past lives, I would say that I must have been an aborigine who played the didgeridoo in a past life. The sound resonates with me on a very primal level. I have owned a didgeridoo for about 2 years but only been able to drone and make one or two vocalizations. The circular breathing has always been a desire for me to learn and I am glad to learn it from one so competent. I will keep practicing the basics and hopefully when I am more capable I will register to learn the more advanced techniques. Many thanks again my friend. If you ever require spiritual guidance, I would be happy to walk beside you on your discoveries. Perhaps we can continue a conversation about that. Yeah i really liked the didgeridoo dojo site. I think its awesome because its so easy to use and understand, also its grows how every lesson has its own video clip which i think is perfect for really nailin the practice in peoples heads. I think you have done an awesome job on the site and don't worry i will be buying many items from didgeridoo breath. Im actually going to purchase a didge and a stand from you guys tonight! It would be awesome to have people like you guys from the didgeridoo dojo team to hold workshops and things like that around OZ for the people who are interested and inspired such as myself. Thanks for your awesome website and exceptional service. I have been a didge fan for twenty years now. I was obsessive for the first ten but haven't played much for the last ten. Now I am back with a vengeance and confidant that I can get my playing to the level that I want it. Thanks to the Didgeridoo Dojo, I have at my fingertips everything that I need to rework my understanding of all the basics and challenge myself with lots of new ideas and ways of putting it all together. I have used lots of learning tools in the past and yours is by far the best. Of many, many, many circular breathing technique videos, yours has proven to be the easiest explanation, and the only one that truly worked for me the fastest. I am well on my way to getting it down. Thank you very much Sanshi and all other guys who do the Dojo! Thanks for the heads up and thanks for the free trial period. Your lessons are great, and easy to follow. I'm sure I will subscribe to some more lessons in the near future. Saludos desde Chile!!! koka here, from Chile!! i really thank you & all team from didgeridoo dojo!!.. i have been completely stoked about the dojo! i got a didg a few years ago & never had good instruction in circular breathing so i just kinda let it sit in the corner. but your instructions & lessons made it so much easier for me! thanks so much! you guys rock! I want to thank you for your great lessons on circular breathing. I have had a didge for quite a while but have never been able to do the circular breathing. Your lessons have been very helpful and I am just about getting it. I can feel it almost there and that is after only a week at it. I am going to sign up for further work on your site after I "get" the circular breathing down pat and I can work on incorporating the other stuff into the drone part. Elaine, here (Earl Clement's Butterfly Didge). I have to tell you, I think I own every instructional DVD, VHS, audio series, and books that are out there. I have spent countless hours at www.howtoplaydidgeridoo.com, on youtube, and I can confidently say, that what you have created is by FAR, head and shoulders above the rest!! You have found a way to actually TEACH, and to teach with clarity and simplicity! Having the ability to break down a skill to its most basic component, and then to bring the student with you as you build it back up again? Well, that is a skill that few teachers have - and you've got it! When I watch a Dojo demonstration, I find myself saying, "I can do THAT." And then I do! Often times, other teachers show us something, then they do it into the camera, without providing the journey of learning, inbetween - sink or swim. "Now, what is he doing?" Rewind, watch again, rewind, listen closer, rewind, scratch my head, rewind, try it for the 100th time, rewind, thunk my head with the didgeridoo, rewind, throw the DVD out the window!!!" At the Dojo, once is enough! Your approach is easy to understand, methodically presented in small steps (one step at a time with gradual advancement), and it is done in an open, friendly, animated, generous, and non-threatening way. (Can you tell I am a Dojo fan?) You are not only inviting us to go on a journey with you, but as a student, I feel compelled to continue traveling just to see where we are going! You are taking me somewhere, all the way, and you are seeing to it that I am going to get there!!! All I have to do is walk. Most instructional material will cover the beginning skills, and then stop. I have a couple that might take me a few steps farther, but not much more. In that experience, I find myself abandoned. But, you have knocked it out of the park, all the way!!! There are some things I have heard from other players that I have tried to reproduce on my own, but without much success. Didgeridoo Dojo has taken the mystery out of advancing as a didgeridoo player and I KNOW it will save me YEARS of trying to emulate something that no one could show me. (We don't have didge teachers around here, much less players). Anyone who uses the dojo has available to them anything they would want! The only thing left to do is to practice! It's there for the taking! So, to the BEST didgeridoo teacher in the world, literally, I tip my hat to you in gratitude and appreciation! Thank you again for your help, your site, and your enthusiasm. Your the best on the web by far. Wish I could fly there just to be there in person. Your the best! Here's to a wonderful, joyous and prosperous New Year for you and the team! Right now i am in the process of receiving another didgeridoo made of the Agave cactus (75 inches tall, 11 inch bell, low C# ) that i have been making payments on. Now that its finally paid off, I can focus on expanding my sound by enrolling in your LIFETIME membership due to my fascination with the didj and my love for the sonic sounds I can create through it! So what better way would I have, but to go to Didgeridoo Dojo!! I will be enrolling FOR SURE! You and the team have an awesome site. Your lessons are wonderfully structured and you are a very positive and helpful mentor. Take it from an educator, many go through bachelor and master courses for skills to develop instruction the way you do. I wish you all the best and have all confidence DidgeridooBreath will be an astounding success. I totally LOVE your videos! I am a senior citizen and have always wanted to learn how to play the didge with endless failed attempts at circular breathing. BUT now, thanks to your instructive step by step videos, I can do it! I just wanted to tell you that I love the site very much. I used to play a little bit of the didge years ago but I dropped it until recently. I picked it up again when I learned that playing the didge can help with snoring/sleep apnea. I will have to say, it really does work for that but your site has helped me a lot getting back into it again and now I am hooked.. I am using the site everyday. Your site is an example of the best things the Internet can help with :). Music woman in oakland california. One huge thing I really like is your energy and excitement level Sanshi-san. You always look super happy and excited to share what you are teaching. I wish my Iaido Sensei had your energy and way of teaching. 1,000 times a day reminds me of him in a big way. You break it down, nice and slow for a beginner to see how it works and we simply need to follow along and practice. The fact I could circular breath so quickly makes me believe I can learn the rest if I take the time and apply myself every day for at least one hour of playing, I try to get more if I can find the time. It's fantastic I can sit at home in front of the computer, pull up a lesson and practice along with you. A few days later if I am thinking, what did he say again? I just log in, click the lesson and bingo back to what you had said. Sanshi is amazing, I would like to meet with him if he comes to Los Angeles. Thank you Sanshi, you are a man full of passion. Just saying thanks for a great place to learn. You have done a perfect job with the lessons. Hoping to play well one day! I am impressed with the site and are going to sign up soon for a year membership, as I think your price for what you give in return is a great deal!! Also, I enjoy learning from people who are passionate about what they are playing...that is very inspiring! I absolutely love the new didgeridoo Dojo. I've been playing around with my didge for a little while but i have learnt a lot more since watching the sessions i have just finished watching the rhythms section, just fantastic the sounds from some simple words mind boggling . Keep up the good work. The website is very nicely designed and the instruction is excellent. Man, the website is awesome! I did check the DidgeWiki and registered for the 7-day trial and checked the member's lesson. All the are great. As soon I learn the circular breathing I will sign up for one plan. Totally worth! If I have any idea for the website I will let you know. I want to thank you for your attentivness and congratulate you guys on the exelent content on the site!!! Hope to take up one of the packages as soon as I graduate and have more time to play my didgi! Have a good one and thanks!!! Best money I've spent in 2011 thanks so much for making this resource available to those of us who love the didge, but have no means of taking our play to the next level. Keep up the great work!! The Dojo is absolutely BRILLIANT and has changed my life! You deal with so many things that interest me and others including nasal exhalation (in emergency only of course! ), solo construction and so many other things which are not easily dealt with in group or one to one lessons. THANK YOU and the team !!! I've watched so many of your videos, I feel like I know you! Haha. Thanks for the mail. Your site is really great -- super complete and informative. I'm right at the beginning, but it looks like you have plenty of information to get me started and help me to progress through advanced techniques. And it even works on my iPad. Kudos! I've been interested in this mysterious instrument for a while now, and after watching some of the beginner lessons, I actually think I have a chance of being able to learn to play it. I'll be ordering one of your "starter packs" this weekend after I decide exactly what I want. Your website and your lessons are awesome! Congratulations...it's too much funny and usefull! I think the sense of familiarity is due to your style of teaching. It's informal, down to earth, laid back, simple but effective, and sincere, all of which makes for a fun and friendly learning experience. The way you break down the components of each sound and run through the steps slowly and carefully to translate effectively how best to achieve the goal is simply perfect and has already proven great results for me in a short space of time. When I found out about your didgeridoodojo.com website this past weekend, I couldn't believe my luck! Here, in one place, is everything I need to be able to learn to play the didgeridoo like a pro. The Dojo is really awesome and other than live one on one I believe it is the single greatest didge instruction site that I have ever seen. I like the one on one feel that the videos give you--and that you can pause it, practice, play again until you get it right. Unlike live instruction you can come back anytime to practice which is really cool if you have a random schedule like I do. It makes learning so much more fun and easy. I also really like Sanshi's good natured attitude and excellent way of explaining each lesson. Thank you all for setting up the Didge Dojo--I look forward to many more hours of practice when it is cold and snowy outside. I'd like to thank you guys for an awesome website and especially all the videos and the great teaching job Sanshi does. I have learned so much from you guys and hope that I can even come close to playing as good. But I will not stop until I do, and then I'll really have fun! I think I'm the only Didj player for 200 miles in every direction. Hope to take my dream vacation (holiday) and come visit you in W.Aus. someday soon. I just wanted to tell the dojo team that you taught me to circular breath, tongue roll and manage a handful of other fun vocals in three days. I also want to commend you on Sanshi's excellent instruction. From detailed descriptions to the demo and playing along with him he is very polished. I studied piano for 20 years, so I've studied under several instructors and Sanshi is quite possible the best of the lot. Together with the awesome videos and website (truly well done), you guys are running a well oiled machine. I'm lucky I stumbled across it and have nothing but good things to say about it. I had to write to thank you and tell you how much I appreciate the work you've done. I was surprised at how awesome your site it when I joined. To tell you the truth everything seems perfect to me, especially the casual lesson option. Worth every cent. So my only feedback is, keep up the great work! I seriously don't know how you could make it any better! Wow i'm soo surprised about didgeridoo dojo!! it's such a great "school" to improve playing the didgeridoo! i'm already back in germany with my didg and practise every day with didgeridoo dojo!! but it's so great and thank you very much for it! you're a great teacher and because of you i already improved a lot! SANSHI! you are a legend mate. I was circular breathing after 4 days.... yes FOUR! easy to learn and had me playing wicked droning and wobbles in 6... next holiday I plan is to fremantle to come see you guys and buy my first good didge. You have created some great here! The lessons are well structured and easy to follow. There are many people who would like to learn playing the Didgeridoo but good teachers are hard to find. With the Didgeridoo Dojo everyone can learn, regardless where they are. Thanks for making this and keep the good thing going. Hi Sanshi ... im loving the didgeridojo.. i have only had my didge since august, i got it as a 40th birthday present !! Love you work sanshi .. cant wait to learn more so i can play better !! I've honestly learned more over the past 2 days on Didgeridoo dojo than with any other online teacher. I'm so happy that I found it and happy that I am finally able to learn! So far, I found everything really helpful, clear...it s amazing! I was getting discouraged cause I could not do many things but now I m practicing every day thanks to Dojo! I ve a great teacher here in Amsterdam, Lies, but only once a week so think ill start seriously to use ur didgeridoo dojo! I´m very happy about didgeridoodjo! Until now it was very hard to find advanced lessions beyond the normal beginner lessions. Good work! I just wanted to extend my gratitude for the resources you provide. You have taken didgeridoo education to a new level of dignity and understanding that has never been done before. Truly an outstanding achievement and demonstrates your sincerity and passion for helping others. I love the Didge Dojo! It is well thought out, constructed and instructed and it is going to be a wonderful resource for Didgeridoo players all over the world! We'd love your feedback, what do you think of the Dojo?